Jaguar E-Type Wins The Best British Car Ever! - Muscle Cars Zone! 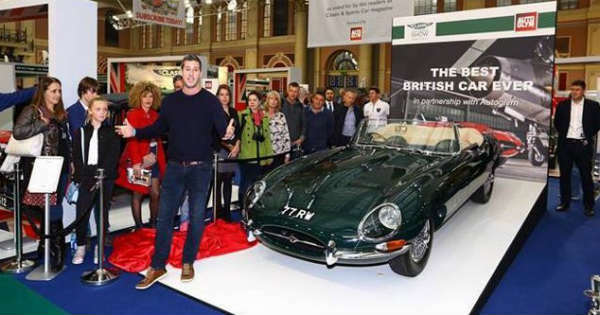 Jaguar E-Type Wins The Best British Car Ever! Right after the barrel roll record by Jaguar E-Type, we give more info on this elegant beast! Over the past hundred years, the UK is known for producing great cars; some of them will be remembered as car classics, some probably not. There are probably several cars which anyone could recognize, even those who are not into the car world as much. Some of them are the one and only Mini Cooper, the Rolls Royce Silver Ghost and so on. We should also mention the McLaren nailing the F1 tracks too! But which car stands out from all of these and takes all the honors? It is the almighty Jaguar E-Type, the British diamond. This all-time classic beast has been chosen by the Classic & Sportscar – London and awarded as the best British car ever! The vote took place at Alexandra Palace, Coventry, UK, and thousands of people participated in. Since the car was revealed in Geneva in 1961 at the Geneva Motor Show, it has been a great success. It was a big hit even back in the days. The Jaguar E-Type was planned to be used only for racing! Interesting fact is that Jaguar`s test driver back then was Norman Dewis who drove the car from Coventry to Geneva just to get in time for the show! However, the 2016 Jaguar F-Type left a great impression upon us!